Central Slovakia, accomodation - how to get ? How to get to Slovakia? How can I get to Slovakia, namely "Zavadka nad Hronom" village? 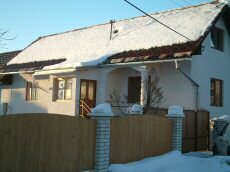 Our guest house is located in the village Závadka nad Hronom, half way from Brezno to Cervena skala, 28km from Brezno. With the minimum group of 3 people we can arrange to pick you up from Budapest, Vienna, or Bratislava airport the time you specify and drive you directly to Zavadka nad Hronom - aditional surcharge of EUR 150. Where in the village is the house ? Our family house is located at the beginning of the "Zavadka nad Hronom village", from direction Brezno, Polomka. just as you will enter the willage, right behind the table "Zavadka nad Hronom", take the first turn left and you are there! Our guesthouse is the second house on the left side. Arriving by train (15 minutes of walk). Get off the train at Zavadka nad Hronom station and go to the main road (head for the church). At the main road head left, up the hill. On its top, turn right and you are there. Our guesthouse is the second house on the left side. Arriving by bus (10 minutes of walk). You are already on the main road. At the main road head up the hill. On its top, turn right and you are there. Our guesthouse is the second house on the left side. If you get lost in the village, our house is at the beginning of a road that leads to well known hotel "Golden Fish" (Zlata Rybka). After arriving to Slovakia, it is possible to get to the village "Zavadka nad Hronom" by train or bus, you can track the connection here. When travelling by train, there is a direct connection from Bratislava ( train from "Bratislava" through "Zvolen" to"Margecany"). When travelling by bus, get to "Brezno" first and by suburban lines directly to the village. If it won't be possible to get directly to "Zavadka nad Hronom", try to get to any of these towns "Brezno, Banska Bystrica or Zvolen" (the closest is Brezno - 25 km only, Banska Bystrica is 60 km away and farest is Zvolen - 80 km). After you will reach any of these towns, just call Mr. Tomas Kovac at +421-(0)911-543211 and we will try to pick you up as soon as possible. For bikers there is an interesting fact to mention, Zavadka nad Hronom is located half way between the Low Tatra bike pass from Liptov region to Horehron region (pass Priehyba) and picturesque path leading through the heart of young National park Muran plateau (Zavadka nad Hronom to Tisovec, pass Burda).